September 12th is National Day of Encouragement! Isn't that a wonderful thing to celebrate? There are days where each and every one of us needs a little encouragement, aren't there? Perhaps we're dealing with medical struggles. Perhaps our kids our going through a rough stage. Perhaps we're having troubles at work or in our marriage. Everyone needs a little extra encouragement here and there. So, how do we offer encouragement? 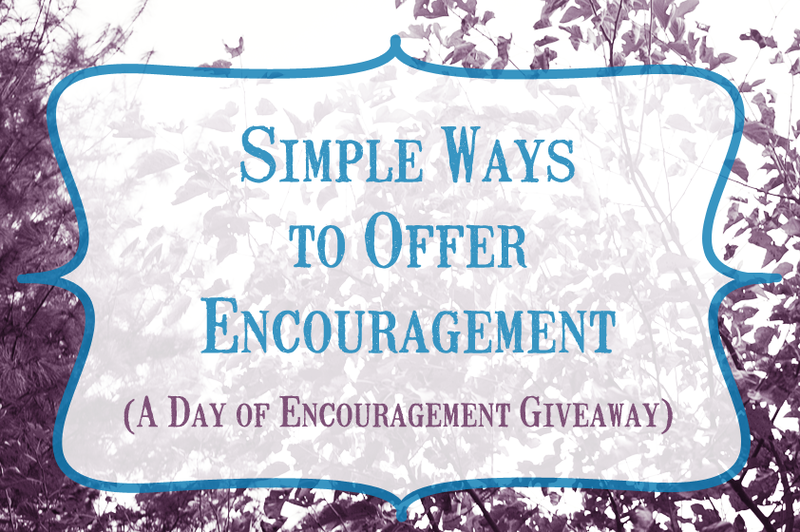 In honor of Day of Encouragement, today I'm sharing some tips for simple ways to offer encouragement to those around you. Write a Note. There's nothing that can turn my day around than a quick note from a friend- just to let you know that you were thought of! For friends far away, send a fun card. For friend close by, drop it on their doorstep or their desk for a fun surprise. Smile & Say Hello. Too often it seems we are stuck in our own worlds when we're out and about, doesn't it? Busy, busy, busy...never taking the time to simply look up and check out whats going on around us. I try to make it a point to smile at everyone...they say smiles are contagious, and I tend to think that's true. It's a simple way to make someone's day a little bit brighter. Create a Gift Basket. I love gift baskets! They're such a fun way to let someone know you care about them. Have a friend in need of encouragement? Create a fun gift basket with a cute journal, pens and a coffee mug. Or go with a spa theme with body washes and aromatherapy candles. Pray for Them. One of the best ways to encourage someone is to pray for them You don't have to know all the details of their life, God knows already. Just simply pray. Give a Compliment. I consider myself to be a very humble person, but I have to admit, it always brings a smile to my face when someone sends a compliment my way. It can be as simple as telling someone you like their outfit, or acknowledging the work and dedication they put into a project. Everyone loves to hear 'job well done'. Have Lunch. Again, a simple lunch (or breakfast or dinner) out with a friend can do wonders for the spirit. It doesn't have to be fancy. In fact, it can even be at your home. It just needs to be some time together to chat and enjoy! Give Them a Bible. We all know the Bible is packed full of encouraging words, so what greater gift is there for someone that needs a little extra encouragement? There are Bibles designed for encouragement, or do something more fun like a journaling Bible and pen set. If that's not in the budget, a simple bible is just as effective! Offer Help. Now, as someone who could use this type of encouragement, I'll admit, I won't always take it...but it's nice to have the offer. So offer to help where you can and be ready to actually follow through. Babysit her kids, take her out for dinner, mow her lawn. Find out what you can do. Simply Listen. Sometimes all we need is for someone to simply be there and offer an ear. I'd love to get a bunch of gifts to give people when they're home sick or going through a hard time! I like their coffee mugs. A nice friendly encouragement to wake up to each morning. i would give a gift basket to my daughter in law. I would use this gift card to buy things for my daughter who has endured 3 major operations in the past three years and faces a difficult life every day as a result. I would give some books and music to loved ones. I would love to give my Pastor and his wife a gift, they give so much to others! I will use this prize to purchase an inspiration and affirmation book for my two closest lady friends!! I feel like reading and hearing positive words every day would just be amazing for the both of them! !